To make its sales tax measure as enticing as possible, the City has made numerous promises. The most expensive of which by far is the promise of a new library. Consequently, if you haven't made up your mind on Measure C (or even if you have), you should be asking yourself, "is this proposed new library really such a good idea?" I say no; it isn't. It's not that I dislike libraries or believe nothing should be done to improve our existing library situation. It's just that the proposal before us is ridiculously exorbitant and a big mistake. We really have to strike a better balance between the reality of the digital information age and what we already have available to us, all the while continuing to live within our means. Presently, the City is proposing to construct a three-story, 55,000-sq-ft library at a cost of $60-million which equates to $1,100 per sq-ft. 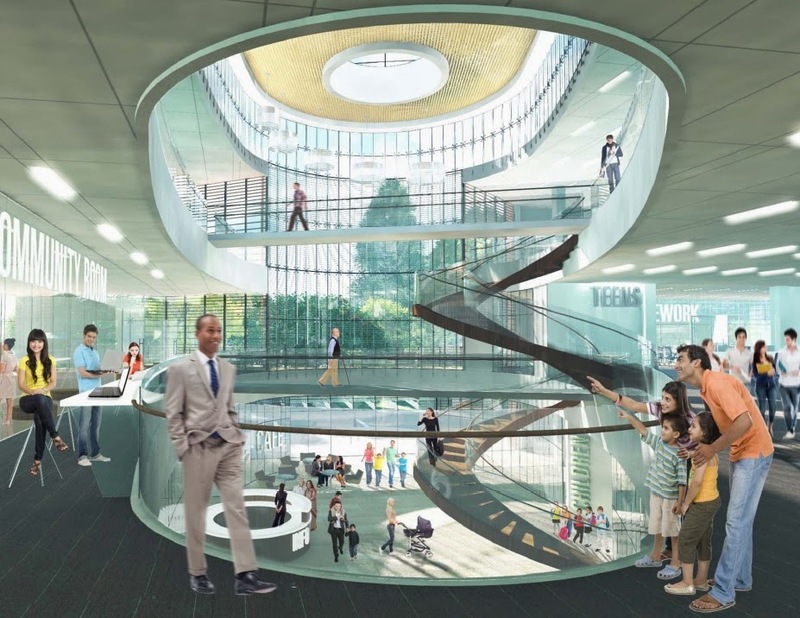 This would be the most expensive new library endeavor in the Bay Area since the monumental collaboration 12-years ago between San Jose State and the City of San Jose. The information in the chart above was compiled and presented to the Hayward City Council on March 4, 2014 by library supporter Cheryl Penick. In addition to the $60-million construction cost, the City would incur a $30-million financing charge (inferred from the City's staff report on Measure C, a snippet of which is shown below). So when all is said and done, this single building will actually have cost us $90-million. That's $600 for every man, woman, and child living in Hayward today. The image above is a snippet from the project/services table presented in the March 4, 2014 city staff report on Measure C. The text in red is an annotation by this blog author to show the derivation of the otherwise undisclosed $90M total cost. Architect's rendering of the proposed library's interior showing patrons wandering around a vast open space. Admittedly pretty to look at, but at an ultimate cost of $90-million one has to doubt if this is at all practical, necessary, or worthwhile. For 90-million dollars, we're supposed to get 50-percent more shelving space than the existing main library according to city staff. But what exactly is going to go on all this shelving? After-all this is supposed to be a "21st Century Library of the Future," and only an ostrich with its head in the sand can't see that the future is all digital. Printed books are going the way of the retailers that once sold them--Crown Books, Waldenbooks, Borders Books--all gone. But if you're the ostrich who thinks this isn't going to happen, then invest in Barnes & Nobles. They're currently having a great sale on their stock. The same can be said for all physical forms of audio and visual media. Say good-bye to CDs and DVDs just as you have to Tower Records and Blockbuster Video. The fact is, the future has arrived. It's digital, and it doesn't require shelving--not in a store and not in a library. The problem here is that the City's proposal is based on the wishes of library enthusiasts that were gathered in the latter half of 2007--2½-years before the release of the first iPad. The world of information exchange has changed a lot in seven years. High speed Internet and cheap digital storage memory have become ubiquitous. Today people can access more current information than any library could possibly hold right from the device they carry in the palm of their hand. Odds are you're doing so right this very minute. Supporters of the proposed library argue that besides more shelving space, the new library is needed for more meeting space. This is nonsense; we already have all we need. We already have invested millions toward the new construction and refurbishment of some really great spaces all throughout our community. We just need to make better use of them. Not more than a 5-minute walk from the existing main library is our $35-million City Hall. For public meetings (and even private functions) it has a beautiful rotunda, auditorium, and a large, easily accessible meeting room above the lobby. The City Hall also has a vast unused corridor that could be re-purposed as a public Internet cafe if the number of terminals in the existing library are deemed insufficient for the demand. 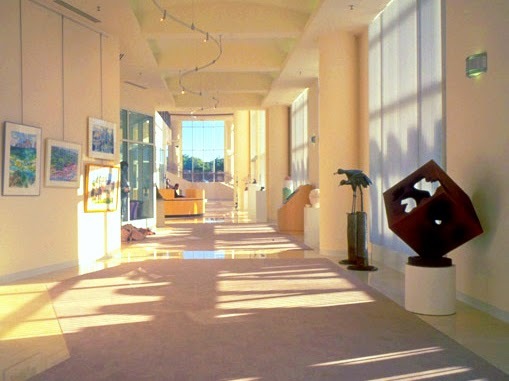 Existing public meeting spaces in Hayward's City Hall include the rotunda (left), the city council auditorium (right), and Room 2 (not shown) above the lobby. An unused, off-limits, wasted space corridor in our existing City Hall. Its 100-ft length and generous width could accommodate at least 50 public Internet terminals that could be watched over by the existing lobby receptionist/security-guard. Additionally, in 2008 voters approved Measure I which authorized $205-million in improvements to our local schools, including: MLK Middle School, Schafer Park Elementary, and Tyrell Elementary. All of these schools serve as excellent locations for meeting and tutoring; after-all that's their principle function. Another great facility is Burbank Elementary School where my neighborhood group meets on a regular basis. In addition to these and other schools, we also have the HARD community centers. Or how about the facilities of other public entities like the Flood Control District offices where the most recent candidates forum took place? The fact of the matter is, we have many decent places to conveniently gather and meet if only we make the effort to arrange for it. Still not convinced that this proposal is a mistake? Then consider the wisdom of further perpetuating the existing seismic hazard by building a three-story, public assembly building filled with thousands of unrestrained projectiles across the street from "America's most dangerous fault." It sure seems like a mistake to me. 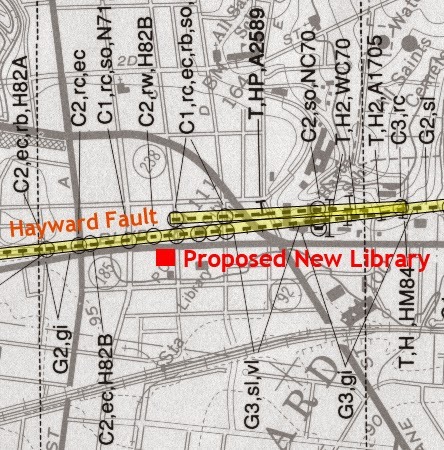 USGS map of Hayward Fault traces and their proximity to the proposed library site. So, what do we do if not move forward with the City's proposal? We should work with what we have, just as any sensible Hayward resident or business would do. 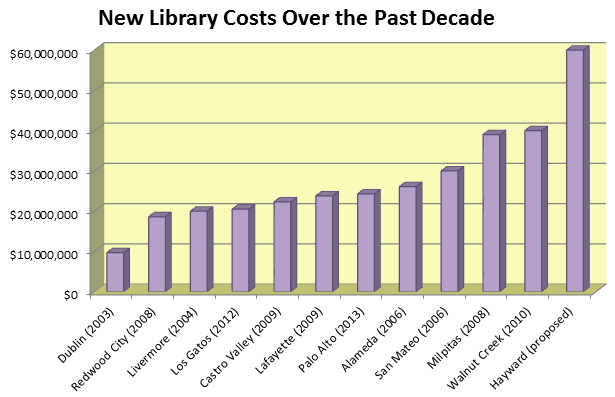 We've got an existing library that needs upgrades and renovation, and we have a $10-million "gift" from the Calpine Corporation (at least we did before the City started spending it on Measure C consultants). If we can't accomplish the necessary upgrades and renovation for $10-million, then we're doing something wrong. But if utilizing what we have is too modest of an approach for the big spenders in the community who just can't do without a dedicated, glistening new building, then at least let's consider collaboration--let's share the cost. We could follow in the footsteps of Albany, Dublin, Fremont, Newark and Union City and join the Alameda County Library system. Or perhaps we could collaborate with the university like San Jose did, or partner with Chabot College or the Hayward Unified School District. The fact is we can do a lot with what we have and with the partnerships we could form. We do not need a $90-million library, and we definitely don't need to be burdened with more unnecessary taxes. What does it say about a society that would spend $90,000,000 to house antiquated materials, but won’t spend a dime on the poor souls who occupy the majority of the library by day and literally freeze to death outside its walls at night? Where are our priorities? And where, by-the-way, are the homeless in the artist’s rendering? Will they be banished from Hayward’s opulent cathedral? What does it say? It says that the people in power are out of touch with the people they are meant to serve. It's obscene to even think of this new library while cutting salaries for the lowest paid workers and creating new ordinances that criminalize the poor.